OUT OF STOCK UNTIL FEBRUARY 1, 2015! Want a commercial canopy that is built to last? The Undercover UC-3R10CRS Canopy Tent is just what you need. This instant canopy package is unmatched in functional design, quality and value. The core strength of its frame is very impressive and will endure years of service when properly anchored. The lightweight construction allows for one-person operation, transport and setup-in-seconds. Watch this video below to see how easy it is to use the unique curtain feature for this canopy: Undercover 10x10 CRS Demonstration. The new UC-3R10 Popup-Shade CRS by Undercover is a best seller for three main reasons. It weighs only 52 lbs, incredibly easy-to-setup and includes our CRS wall package. There's huge added value that includes a (4) piece polyester hanging wall system, deluxe wheel spin-bag (4) elegant hook and loop fasteners leg curtains & (4) piece anchoring spikes. This frame has all ALUMINUM legs with STEEL trusses making it super strong and durable. Vendors take notice! 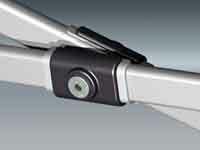 Never before has anyone offered a polyester curtain rail system like this! It will provide for a new level of elegance and attractive eye appeal not found on any other instant canopy product line. An innovative differentiation that results in added sales and increased visibility in the field. 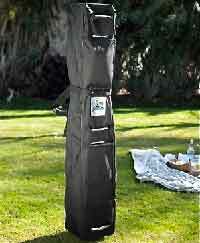 Best for outdoor vending, special events, BBQ's, outdoor sports activities and home. 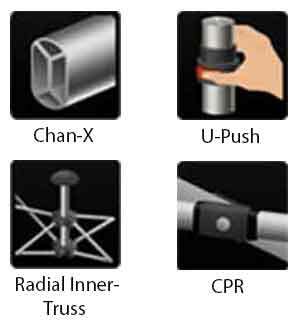 A customized way to hang walls that maximizes possible setup configurations. You can easily create zippered enclosures or setup a single back-wall and showcase elegant leg curtains. How about hanging three sidewalls with an open front. This adaptive CRS hanging wall system creates a variety of options for vendors, exhibitors and or outdoor family party situations. Imagine total wall functionality with no unsightly, cumbersome hook and loop fasteners straps to fool with. Undercover's new UC-3 features adaptive internal and external support brackets on all twelve critical axial points providing enhanced durability of core structure during setup and takedown. An innovative differentiation that results in added sales and increased visibility in the field. 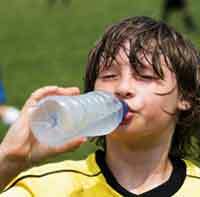 Don't be caught sweating out in the hot sun! 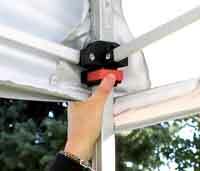 Provide shelter with this canopy and you will have plenty of smiles! Head Clearance: 72" to 84"
What's in the box: CRS frame, polyester top, (4) polyester zippered walls, wheel spin-bag and spikes. Order your UC-3R10 Popup-Shade Canopy Tent 10X10 CRS today!This canopy is a temporary shelter and NOT TO BE LEFT ALONE! 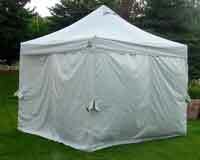 If inclement weather arrives then you need to take this canopy down. Extended rain and winds in excess of 10-15 MPH will damage and or destroy your canopy. 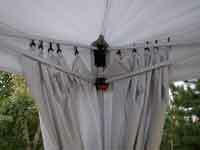 Water that collects on the top will also destroy the top and frame so NEVER LEAVE YOUR CANOPY UNATTENDED! 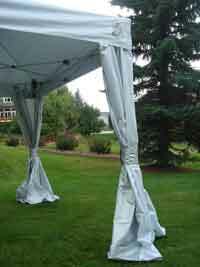 Impact Canopy 10 x 10 Canopy Sidewalls Kit 2 Pack WALLS ONLY!